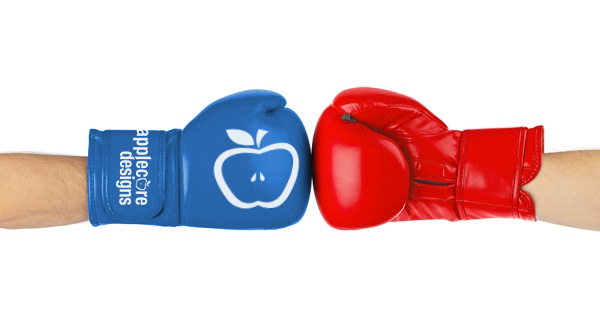 In 2016, Applecore Designs announced a fixed term finance agreement offering many advantages over an outright cash purchase and a very cost-effective way to invest in business equipment in particular model-based design and BIM authoring software. A large number of small to medium size studios took up the option pay for ARCHICAD perpetual licences on a monthly basis. During this period, the studio received email and telephone as well as full product upgrades. A three year fixed term agreement for ARCHICAD Teamwork licence with 36 months full product upgrades/support is available for £199.00 + VAT per month. More importantly, transfer of title is obtained when all payments are made allowing the use of the software indefinitely. From month 37 onwards, the licence drops to maintenance mode with again includes email and telephone as well as full product upgrades. In the same year, Autodesk made the transition from maintenance licenses to their Product Subscription plans which initially appeared cost effective with promotional offers, but we stated that customers would pay significantly more in the long run by moving over to a Subscription model. 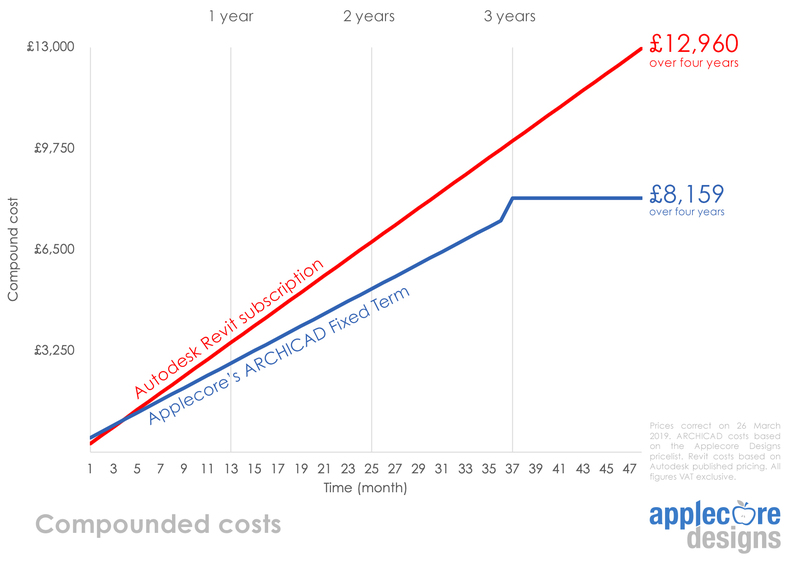 The graph below shows a studio comparing the cost of a single ARCHICAD Fixed Term v Revit Subscription paying monthly. Over a four-year period implementing ARCHICAD saves £4,801 + VAT per licence, with a yearly saving of £2,520.00 + VAT thereafter. Internal reporting shows that most studios currently using or looking at implementing ARCHICAD fall in the 5-9 user bracket. To our knowledge Autodesk do not offer multi-user discounts on subscription, whereas with ARCHICAD there are thresholds at five and ten users. The graph below shows a new five user studio comparing the cost of an ARCHICAD Fixed Term v Revit Subscription paying monthly. Over a four-year period implementing ARCHICAD saves £28,890 + VAT per licence, with a yearly saving of £12,950.00 + VAT thereafter. Twelve months ago, Graphisoft announced that subscription would be available for ARCHICAD in the UK. While this has been very popular with new start and short-term use, perpetual licence purchase and fixed term is still the most popular licence model. 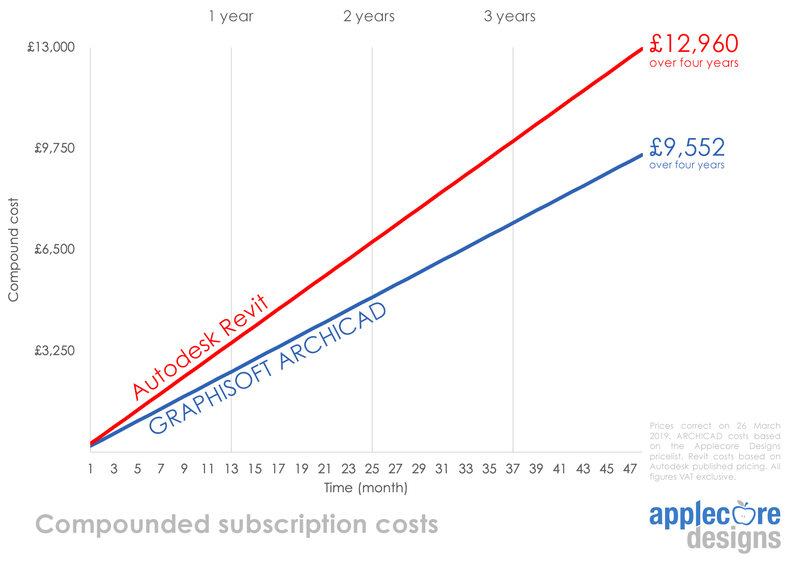 That said, the graph below shows the comparison of ARCHICAD Subscription v Revit Subscription paying monthly. Over a four-year period implementing ARCHICAD saves £3,408 + VAT per licence, with a yearly saving of £852.00 + VAT thereafter. In all cases implementing ARCHICAD is more cost effective than Revit. 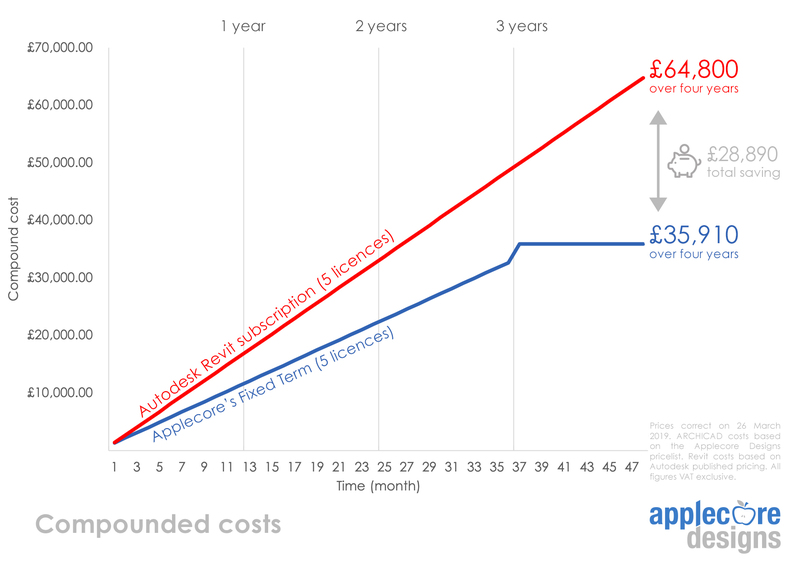 The benefits of investing in perpetual software licences over a fixed term period, rather than opting for the long-term costs associated with a Revit Subscription Plans is all to see in the above graphs. Costs are considerable when implementing multi user teams. In the last three years we have seen a large increase in the number of new users taking up the monthly fixed term plan to implement ARCHICAD in their studio. Which is best option to implement ARCHICAD? The decision is entirely up to you.